Did you know you can recycle ink cartridges at the library? 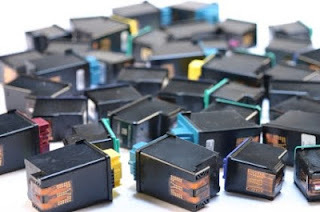 By recycling your empty ink cartridges at the library, you can help us earn vouchers to be used for office supplies. The library can earn $2 per cartridge and can turn in up to 10 cartridges each month. Just bring the cartridges in a plastic bag and turn them in at the 1st floor circulation desk.